Clean-energy mandates in several states require utilities to secure wind power. Above, a wind farm near Block Island. That power line through New Hampshire’s mountains hasn’t quite worked out. And forget about that natural gas pipeline expansion in Massachusetts and Connecticut for now. Two of Eversource’s biggest energy projects — Northern Pass and Access Northeast — were dogged by controversy at every turn. So instead, New England’s largest utility is doubling down on wind and solar power. Often vilified by local environmentalists, Eversource wants to be seen as a catalyst for the region’s clean-energy economy. Case in point: Eversource agreed to invest $225 million in two wind farm projects off the coasts of Rhode Island and Massachusetts, making it a 50-50 partner with the Danish developer Orsted. The deal, announced today, also includes an adjacent 257-square-mile tract of ocean that could be developed eventually. Along with the money, Eversource offers Orsted extensive experience with power-line construction and navigating the region’s government bureaucracies. Eversource had already invested with Orsted on another offshore wind venture in 2016, but it was short money at the time: $10 million for half of Orsted’s Bay State Wind proposal. 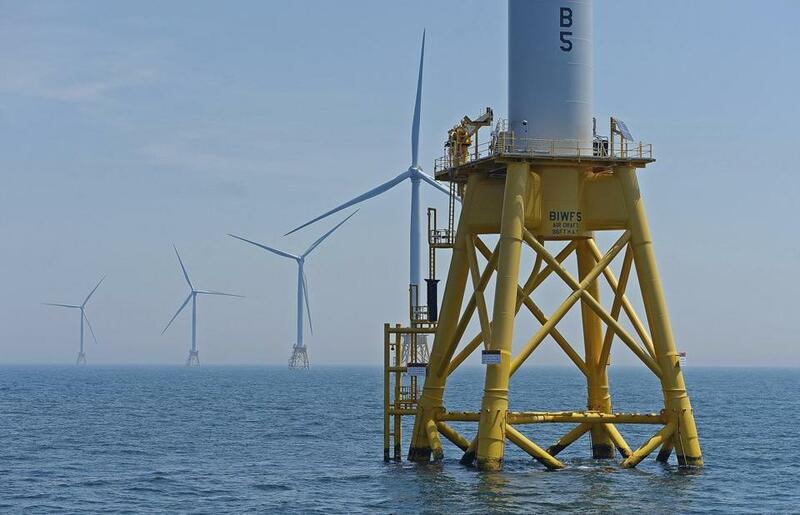 The two partners lost out when Vineyard Wind was picked in a first round of offshore wind contracts for Massachusetts. Meanwhile, rival Deepwater Wind won agreements to serve Rhode Island, Connecticut, and Long Island electricity customers, prompting Orsted to buy the entire company outright. Eversource is now investing in the Deepwater areas that Orsted acquired, including contracts that total 830 megawatts of capacity. Confused yet? You might want to break out a flow chart. Two other players arrived on the scene in December: Equinor (formerly Statoil) and Mayflower Wind (a Shell-EDP Renewables joint venture). They each agreed to pay $135 million to secure leasing rights farther offshore. What’s going on? You can largely thank new clean-energy mandates in several Northeastern states that require utilities to secure large amounts of offshore wind power. Lee Olivier, a top executive at Eversource, says the company recognizes that a major gas expansion such as Access Northeast is unlikely to happen anytime soon. There’s just not enough “stakeholder support” right now. By that, he means the current odds of the Massachusetts Legislature passing a law that allows pipeline expansion costs to be borne by electric ratepayers range between slim and none. Olivier also cites Eversource’s heavy investment in solar as proof of its clean energy bona fides. His company recently completed 17 solar projects in Massachusetts, mostly in the western part of the state, and another two will go online later this year. The utility has state approval to spend as much as $200 million of ratepayer funds on these projects, which will collectively generate up to 62 megawatts. Eversource has warred with enviros over renewable power issues in the past. But Greg Cunningham of the Conservation Law Foundation offers applause for his erstwhile nemesis and its big move into wind. As energy efficiency and solar power curb the overall demand for power, Cunningham says, electric utilities need to find new ways to make money. Not everyone is cheering. Some critics still worry about Eversource being on both sides of these deals, as the seller and buyer of electricity — potentially giving its projects an advantage in the bidding. Eversource probably isn’t the first name that comes to mind when you hear the phrase “renewable power.” But that could change, as its executives increasingly look to harness the potential profits to be found in a cleaner energy future.